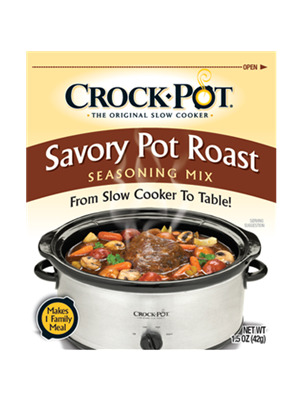 Count on everyone wanting seconds when you serve dinner made with Crock-Pot Savory Pot Roast Seasoning Mix. Lean cuts of meat turn luscious after a long slow cook with this delicious seasoning blend. Blend mix with 1 cup of water. Add roast and 5 cups of fresh vegetables such as celery, onion, carrots and potatoes to slow cooker. Pour seasoning sauce over the meat. Cover and cook on low 8 hours or according to slow cooker directions until meat is completely cooked and tender. Modified corn starch, salt, hydrolyzed soy, corn and wheat gluten protein, dehydrated onion, brown sugar, wheat flour, yeast extract, spices, caramel color, garlic powder, maltodextrin, onion powder, beef broth, rendered beef fat, natural flavor, silicon dioxide.